Birmingham City have completed the signing of Coventry City captain Scott Dann for an undisclosed fee. The 22-year-old defender, who was also a target for fellow Premier League newcomers Wolves, agreed personal terms at St Andrew's on Friday. 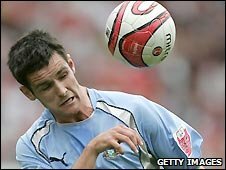 Dann played 49 games for Coventry after signing from Walsall in January 2008. The England under-21 international becomes Alex McLeish's third signing of the summer, following the arrivals of Christian Benitez and Stephen Carr. Carr signed a new contract after helping Blues secure promotion from the Championship in May, while Ecuador striker Benitez signed for an undisclosed fee from Mexican outfit Santos Laguna on 3 June. Dann began his career at Walsall, making 69 appearances and scoring eight goals for the Saddlers, before joining the Sky Blues in a joint-transfer with left-back Daniel Fox. He spent time on loan at Redditch United, Hednesford Town and Danish side Koge BK during his time at the Banks's Stadium. After an impressive start to his time at the Ricoh Arena, Dann was given the captain's armband for the 2008/9 season by Coventry manager Chris Coleman.